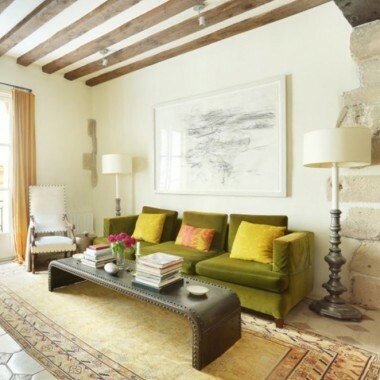 This vacation rental apartment is situated in the most central and charming part of the historic Marais district in Paris, just off a pedestrian square. The neighbourhood has a delightful village-like atmosphere, cafés, a local open street market, shops, monuments and galleries. 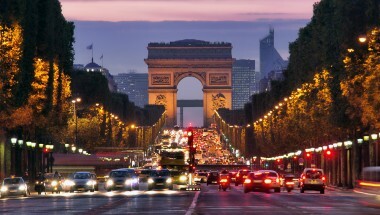 There is also a great choice of restaurants, and local boulangeries are among the best in Paris. 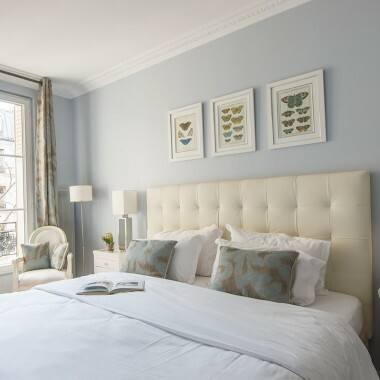 Situated on the fourth floor of a period building, with lift, the apartment rental is very bright, thanks to the many full-length French windows, overlooking the quiet courtyard. On entering the apartment, an entrance hall leads to the open-plan kitchen and living room. The marble fireplace and the original parquet wooden floors add a Parisian touch to this peaceful living room.The dining area easily sits six, and the fully equipped kitchen has plenty of space for meal preparation. There are two very comfortable bedrooms, a master bedroom and a double/twin bedroom, both with modern, well equipped bathrooms with heated towel rails and hair dryers. Further amenities include Cable TV (including CNN, BBC, Skynews), DVD player, Wi-fi internet connection and free phone calls to 70 different countries, including USA, UK, Australia, Canada, Italy, Spain, Israel, China and Ireland. The building has a guardian and access is by interphone and security code. Air conditioning units are provided in both bedrooms. Entrance hall, leading to living/dining room. Open-plan kitchen, very well equipped, including dishwasher, fridge, oven/hob, microwave, toaster, coffee machine, kettle, washing machine and separate clothes dryer. The corridor leads to the first bedroom on your right, with 2 comfortable single beds, which can be united as a queen-sized bed. Adjacent bathroom with large shower, bathtub and 2 washbasins. The master bedroom, at the end of the hallway, has a king-size bed. The en-suite bathroom has a large shower and washbasin. 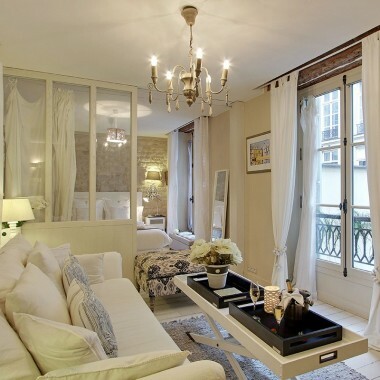 This two-bedroom/two-bathroom vacation rental apartment is situated in a very central and charming part of the historic Marais district in Paris, within easy walking distance of most of the famous sights, including the Seine, Notre Dame cathedral, Hôtel de Ville, the Louvre, the Place des Vosges, the Pompidou Centre and the charming Ile St Louis. N.B. For more than 4 guests staying, there is an additional charge of €65 per person per night.